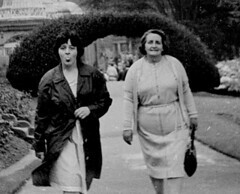 This started out simply as a post highlighting a slightly charming picture of my mother walking at Alton Towers, with her mother, and sticking her tongue out at the camera (held by my father, I presume). But looking at it in flickr and thinking about the people involved got me into thoughts about tagging and sociability. Electronically-stored, people-generated, collaboratively-organised metadata enhances sociability – that’s why tagging has been so hot (or cool – which is it? It can’t be both. Can it?) We get to make serendipitous discoveries of a certain class of social object because of this shift in metadata management. Fantastic. I was speculating tonight that since so much conversation about such objects is in a question and answer form, the certainty provided by attaching metadata could reduce in some way the possibility for social interaction around a well tagged artefact. When, Where, Who, Why are all frequently asked questions. But looking at this picture, it’s easy to see that while metadata would be useful, a fascinating conversation could still ensue around this photograph, if it had just been, say, plucked from an old biscuit tin when my mother (she’s on the left) was helping her mother (on the right) to sort out some junk “Oh look at us!” “When was that then?” “Oh it’s Alton Towers” “Yes the day your father got a flat tyre and had to change the wheel” “So how old was I then?” “Look at you, sticking your tongue out. Oh you must have been 18 because you weren’t married there” “I don’t know, didn’t we have Lloyd with us that day?” “No it was definitely before he was born – you’d just got engaged, I think” “Oh do you remember that dress?” “Yes, I got it off Mrs Winters who lived up at the Cotteridge, it was too big for her Janet and you said you wouldn’t dream of wearing that colour, but you do seem to be wearing it…” on and on and on – believe me, I’ve been listening to these conversations all my life (though I should point out that I have no idea whether any of this is true or I’ve just made it up). No matter how much metadata had been captured about this photograph, the conversation would still have happened and still been as rich – another re-inforced bond between mother and daughter. The bit about “When was that then?” becomes superfluous, but there may well be other details that either or both the participants had forgotten… or not. Really enjoying “pre-alpha” access to seesmic.com the new kid on the lifestream block courtesy of Loïc LeMeur. It’s a closed group for the time being and feels nicely diverse and international which makes a good change from the usual West Coast dominance. Halley Suitt’s french cracks me up as much as it did at the first Les Blogs. The basic premise is like twitter, only in video – there’s a public timeline of new clips. Some are long and dribbly, some are short and snappy. There are lots of tests and mumbling into mics and stuff – good wholesome early day play stuff. What Loïc’s done that’s really smart is that the outputs can leak even though the actual application is not available beyond 150 of us. So I can share a URL with you – here’s me & my ukulele. In fact, when I post a new clip this happens automagically through my twitter stream as I’ve shared my details with them. His other masterstroke is to do a daily video summary – how hard its this and how much buzz does it generate? Why don’t more startups do it? Why am I not doing it? There are 3 options for providing video – you can share a YouTube clip, you can record using a webcam, or you can supply a .flv file. My webcam stuff has been frustrating because I can’t get the sound to work particularly well. I sound as if I have a serious lisp – whereas you all know that I actually have quite a trivial little sibilance problem… The audio ain’t great from the great MacBook iSight unwashed either, so I’m imagining it has something to do with the encoding at seesmic’s end. So the uke clip was an experiment in getting round this by making a quick video on my camcorder capturing straight to my hard disk, quick editing & encoding as .wmv, uploading to blip.tv and then taking the resulting .flv and uploading to seesmic. Any suggestions on shortcutting this that don’t involve me buying new hardware or software are welcomed – I haven’t had a good experience yet with Riva the .flv encoder that is supposed to do the job of converting from .wmv to .flv I want to be able to do it quickly – that’s kind of the point. There are some annoying things in the interface still. Though they’re getting fixed by the hour. I just saw Loïc twitter for example that profile pics are now working properly and sure enough they are 🙂 I had some initial difficulties because I chose a weird user name – it all got sorted very quickly and patiently by Johann the tech guy. Also as it’s such early days I don’t know what should work and what shouldn’t. Of course I’m willing to put up with pretty much anything. I can’t get YouTube vids to work in the seesmic screen, I have to watch them on youtube.com and some .flv uploads have stalled for me too. The buffering settings seem to need tweaking – it doesn’t download enough before starting to play so that it stalls too frequently. It brings home for me again that you have to use these things to really grok them. If you just see someone else’s outputs, whether it’s seesmic, twitter or blogs it’s quite difficult to understand what’s going on. Let’s hope it’s open for more people soon. The really interesting behaviours will emerge I’m sure when we’ve loads of people playing. We’re still regularly finding new applications for twitter for example and I’ve been on that for nearly a year. Thanks Adam for pointing to Michael Billington’s piece on theatre criticism. A great number of the theatre directors I’ve spoke to about in-house (marketing, if you like) blogging they have seen it’s *primary purpose* as circumventing what they see as piss-poor print-bound criticism which can kill a show’s sales just because the critic had a hangover. I sat in front of Mr Billington at a press night last week. He was very well behaved, as you’d expect. The same can’t be said for one of his peers who threatened to disrupt the beginning of the show because the seat he’d been given didn’t suit his taste. Is anyone doing (new)media literacy classes for these poor old hacks? How can we help them distinguish between the different types of blogging in theatre, spot the good stuff in among the rest and understand that you don’t have to read them all, any more than you have to read every column-inch of a newspaper. He says Web2.0 is just a mirror for our culture and society. I see a new-found confidence, optimism and freedom. I see happiness and laughter. I see a breathing out, a loosening of the belt, a relaxing, a kicking off of the shoes. I see humility and humanity. I see maturity. He sees threats, groundless criticism, a loss of authority. He sees immaturity and people making outrageous statements in order to gain attention. He sees selfishness and self-centredness. He sees confusion, stealing and interference. You look in the mirror and you see what you are.